This is the old fashioned quince. It is a fantastic small tree with Spring flowers 2cm across. 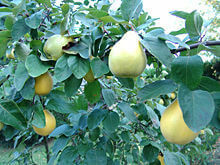 The Quince fruit ripens in Autumn. The fruit is 10 - 15cm across. This form holds its shape and turns the most gorgeous red when cooked.